Last week I had no books for adults and this week I have no books for little kids. It all started early Thursday morning, the day I usually go to my girl's classrooms and read, when I heard my oldest call out at 3:30 in the morning. I found her in her room sick in the bed. After an hour of cleaning up, washing sheets, and loving on her, there was no way we were going to be at school. My husband (who got up and helped me clean up the mess) decided to take the day off (partly out of fear of spreading it to coworkers) and helped me get the younger one to preschool and take care of the older one (I thank God every day for sending me that man). This is all a long winded way of saying that I didn't read to the kids, and didn't have other books here at the house ready for review. We will try the book I have at the ready on the kids next week. That isn't to say I don't have a book for older kids. 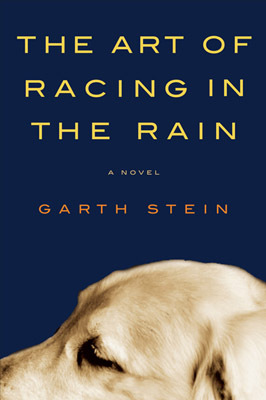 Today's books are The Art of Racing in the Rain by Garth Stein for adults and Flawed Dogs the Novel: The Shocking Raid on Westminster by Berkeley Breathed for juveniles. Let me start off by saying this is another book that I would have passed by had someone not recommended it to me. 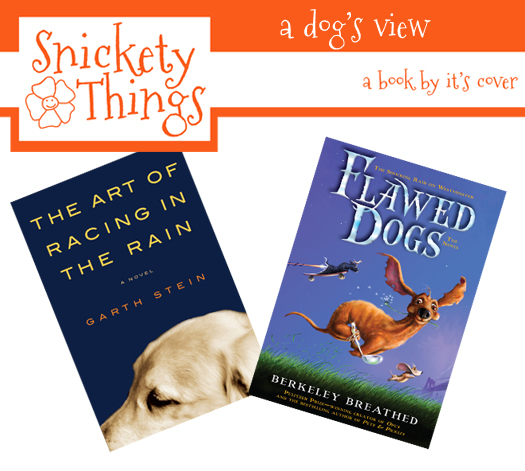 After hearing that the entire book is told from a dog's point of view I thought I would give it a try. The book tells the story of a man who lost his wife and is in jeopardy of losing his child. The dog in the story seems to grasp what is going on in the lives of the characters better than they do themselves. It is a sweet book that makes you want the main character to win at everything by the end of the book. I don't want to say more because I don't want to ruin the book for anyone. It did have some language in it that I personally did not care for and that dropped it half a flower. This book is very emotional. Where to start on this book. I was first introduced to Berkeley Breathed in the comic section of the paper. He does the Bloom County strip. I was excited when I ran across a book of his in the non fiction section of our library in the poetry section. 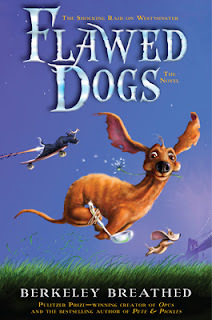 It was called Flawed Dogs: The Year End Leftovers at the Piddleton "Last Chance" Dog Pound and contained short little poems about dogs society no longer wanted (all fictional dogs of course). I was even more excited to find that he expanded Flawed Dogs into a novel (shown above). I checked out the book and started reading. The first chapter nearly made me take the book back. I'm going to warn any dog lovers and parents of sensitive children that the first chapter is pretty rough to get through. If you make it through that one, you will be treated to one of the funniest books you can read. I literally (using this in the correct context) laughed out loud while reading the rest of the book. So much so that I had to stop and repeatedly read little snippets to my husband whenever he asked what was so funny. Now, I am biased towards wiener dogs because I have one. But I think this book will play across to a wider audience than just dog lovers. I would not recommend this book for children under ten because of that intense first chapter. I think mine might be able to handle it by then.